Snickers bars from M&M Mars are the candy bar classic, filled with scrumptious roasted peanuts, chewy caramel and rich nougat, all covered with delicious milk chocolate. Plain and simple, Snickers bars satisfy the hunger that strikes at any given moment. After all, would you expect anything less from the best selling chocolate bar of all time? 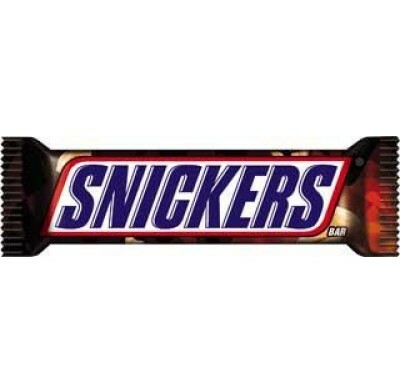 A delicious snack for people of all ages, Snickers bars earn an incredible $2 billion on an annual global scale. The original Snickers candy bar makes a perfect addition to any candy collection, retail inventory or candy store shelf – so, be sure to get your hands on enough bars to cover the unending demands of your hungry customers. Shop online at Sweet City Candy for Snickers candy bars, available now at our low wholesale price. Order a 48-count box filled with individually wrapped Snickers bars today and add it to your retail or candy store inventory. Sweet City Candy is your wholesale candy headquarters. 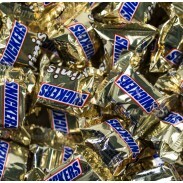 Enjoy Snickers candy delivered fast, right to your door at low wholesale prices. If you can't find the candy or chocolate you are looking for, contact us and we will be happy to help you in any way we can. Note: Nutrition: Serving Size 1 unit (52.7g) Calories 250 Servings Per Container 1 Calories from Fat 110 Amount/Serving %DV* ---------------------------------------------------------------------- Total Fat 12g 18% Sat. Fat 4.5g 23% Trans Fat 0g Cholest. 5mg 2% Sodium 120mg 5% Total Carb. 33g 11% Dietary Fiber 1g 4% Sugars 27g Protein 4g Vitamin A * Vitamin C * Calcium 4% Iron 2% * Contains less than 2% of the Daily Value of these nutrient(s).